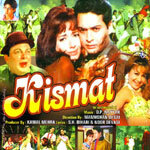 "Kismat" is a 1968 hindi film which has Biswajeet, Babita, Helen, Kamal Mehra and Murad in lead roles. We have 3 songs lyrics and 3 video songs of Kismat. O. P. Nayyar has composed its music. Mahendra Kapoor, Asha Bhosle and Shamshad Begum have sung these songs while S. H. Bihari and Noor Dewasi have penned its lyrics.